MRI is more sensitive than radiography for detecting spinal changes, especially corresponding to the thoracic spine, which is partially obscured by lung tissue and ribs at radiography. MRI can show signs of disease activity (inflammation) in the form of fluid accumulation (oedema) and increased blood flow (contrast enhancement) in the bone marrow and/or joints. In early stages there is often inflammation corresponding to vertebral corners. They occur before the appearance of chronic changes which manifest as contour changes at vertebral corners and new bone formation. MRI can also show chronic changes in the form of fatty accumulation in bone marrow, usually corresponding to vertebral corners, erosion, new bone formation, fusion of vertebrae etc. 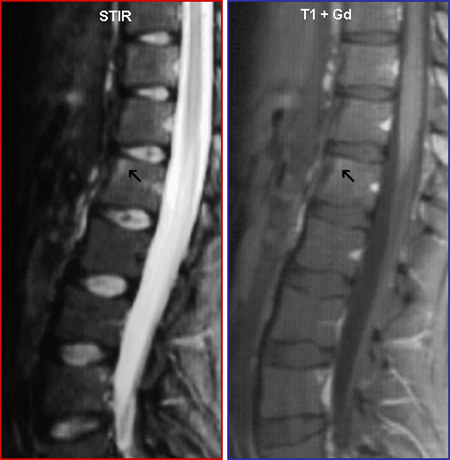 MRI shows mild oedema (STIR) and contrast enhancement (T1 + Gd.) at vertebral corners as evidence of active changes (arrows). 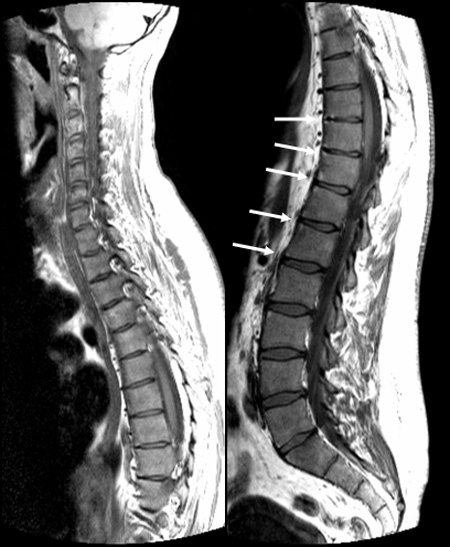 Sagittal T1-weighted images of the whole spine show scattered fatty deposition at vertebral corners as a sign of sequels after inflammation (arrows). 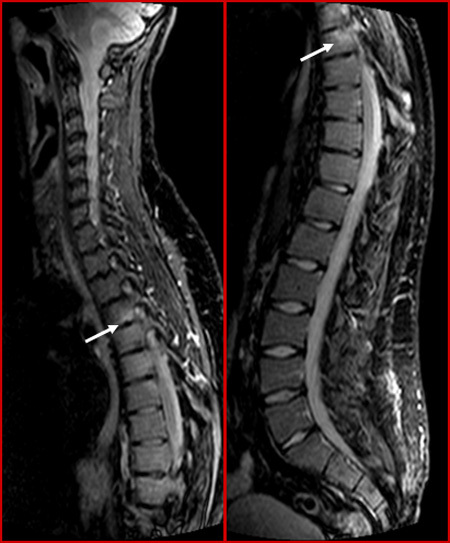 Sagittal STIR images of the whole spine showing oedema at vertebral corners, especially posterior in the thoracic spine, as a sign of active inflammation (arrows).